The US State Department has been sued over its concealment of around 700 transcripts of former Secretary of State Henry Kissinger’s phone conversations in the 1970s. The suit stems from an outstanding Freedom of Information request filed in 2001. The National Security Archive filed suit on Wednesday, calling for the prompt declassification and processing of the 700 or so remaining telephone conversation (telcon) transcripts of Kissinger's official State Dept. business from 1973 to 1977, detailing foreign relations when he was the top diplomat for Presidents Richard Nixon and Gerald Ford. "Notwithstanding the fact that plaintiff submitted its initial FOIA request for the Kissinger telcons more than thirteen years ago, to date, defendant State has not fully responded to plaintiff’s FOIA requests and appeals, in which well over 600 Kissinger telephone conversation transcripts are at issue," according to the complaint, filed in US District Court in Washington. The era of American foreign policy in question included the CIA-fueled coup in Chile that brought Augusto Pinochet to power, the US blessing of Indonesian president Suharto's bloody invasion of East Timor, and the waning years of America's vast war in Indochina, not to mention domestic events such as the fallout from the Watergate scandal and President Nixon’s subsequent resignation. Nixon was granted a presidential pardon by his predecessor, Ford, one month after stepping down. The Kissinger-records flap comes amid a new controversy surrounding another former secretary of State, Hillary Clinton, President Barack Obama’s original top diplomat who, according to reports, ran electronic correspondence through a personal email account administered from her family home while she served in the State Dept. "There's a long track record of secretaries of state having real problems keeping records available for posterity," Tom Blanton, executive director of the National Security Archive, told Politico. With its 2001 legal complaint based on the Federal Records Act, the National Security Archive, an organization that collects declassified government records, successfully compelled the State Dept. 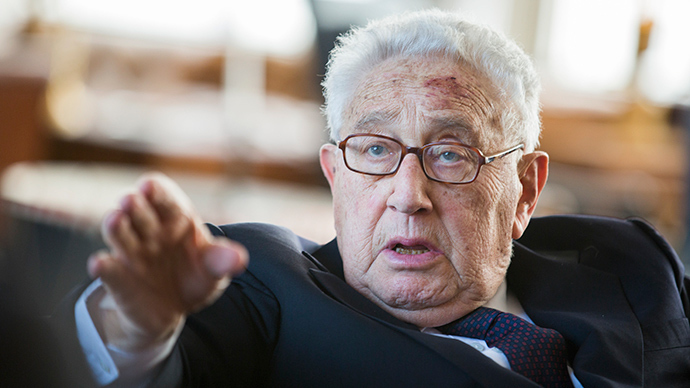 to advise Kissinger to release telcons and other records he had claimed as his own, removing them from his offices upon leaving his post as secretary of state. He had subsequently deposited them at the Library of Congress, seeking to shield them from disclosure. Upon Kissinger’s relent, the Archive then published 15,502 of those conversations in the Digital National Security Archive series. Yet, beginning in 2007, the State Dept. withheld the 700 or so remaining telcons, stating they were "pre-decisional" or exempt from disclosure based on executive privilege, claims that by law cannot hold up after 40 years. Those exceptions were challenged by the Archive in an appeal filed in July 2007. “The Archive's formal appeal of the withholding, along with repeated queries by the Archive to State and the White House Counsel's Office about the status of the telcons, have been met only with years of delay, thus making the lawsuit necessary,” the organization said Wednesday.